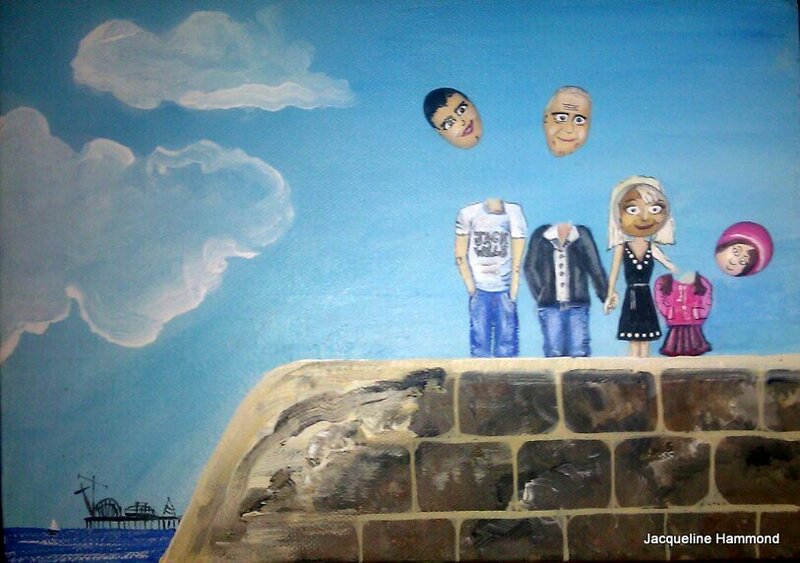 This painting is a commissioned portrait for a client who’s giving it to his wife as a Valentine’s Day present. They’re collecting it tomorrow. I have an ongoing series of paintings known as The Pebble Heads which depict people on a trip to the seaside here in Brighton, England. This is a popular series with visitors to JAG Gallery in Brighton, where I exhibit them. I can often be spotted scrabbling around on the beach collecting suitable shaped pebbles for these paintings. I paint the subjects bodies directly on to the canvas but paint their facial features on to pebbles, incorporating the contours and markings of the pebbles. I then glue the pebbles to the canvas. Most of the subjects in the series are based on my observations of people, but often the pebbles ‘become’ characters once features are painted on. The scene, the pose, the narrative of the portrait seem to occur simultaneously and becomes a caricature as painting progresses. 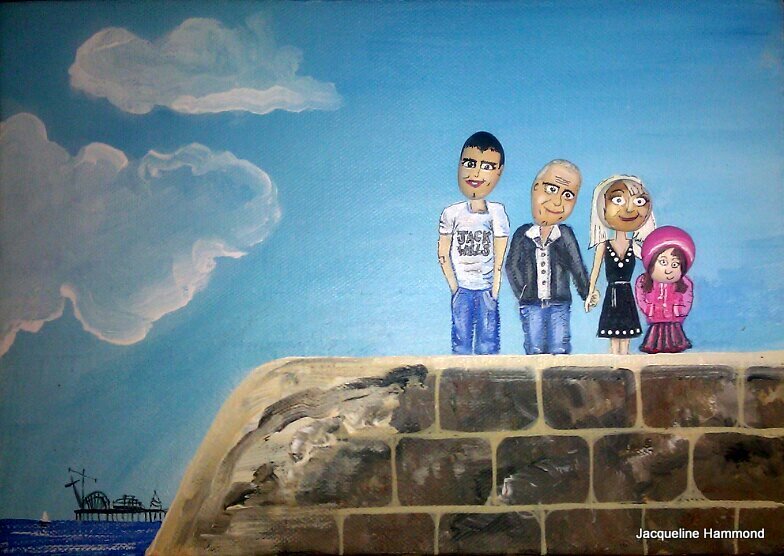 I accept commissions for portraits of family groups, couples or groups of friends. The client just emails photographs of the people to include in the portrait. A photo of the group is ideal as well as ones of the individuals, but it’s important to know the difference in height. I also ask for a few details about things such as favourite clothing, colours, accessories and an idea of character traits is also useful. This is the painting of the family before their heads have been glued on to the canvas. Surreal stage of the painting where the subjects have dismembered heads! 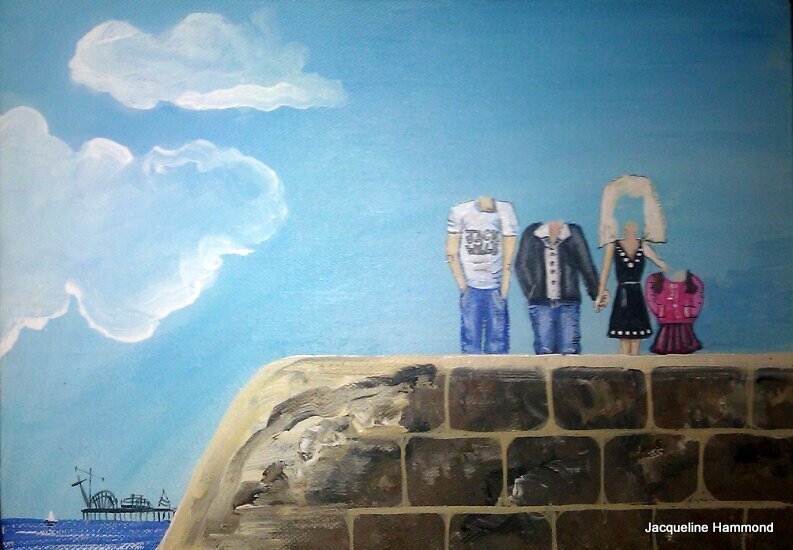 This entry was posted in Art, Painting and tagged acrylics, Art, artist, beach, blue, commission, family, gallery, jacqueline hammond, landscape, Local News - Brighton, paint, painter, Painting, paints, pebbles, picture, portrait, present, seascape, sky, Valentine, valentines day, water, wife. Bookmark the permalink.